Do you remember those days when you moved into your first apartment and it felt like there was SO MUCH SPACE? You dreamed of how you would fill it up- with pretty furniture and decorative accent pieces. There was actually room in your closet for everything you owned at the time. Fast forward to today- when you are sharing your home with all of those little people in your life- and it seems like there is never enough room to store everything you own! 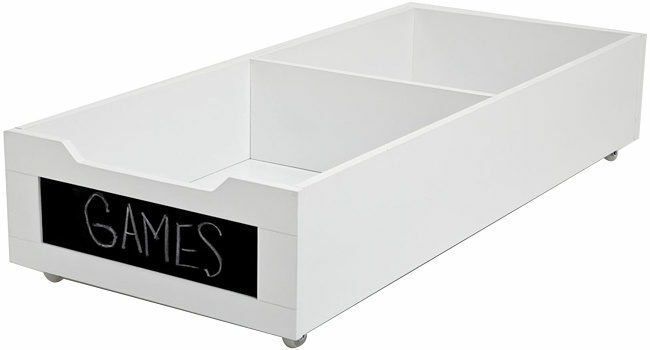 As part of our series of posts on Best Picks for Busy Moms– these fantastic storage ideas will help! Whether you are looking to add storage to your own bedroom, or are transitioning your child's room from a baby room to a toddler bedroom and are looking to maximize your bedroom storage- here are my top picks for storage ideas for the bedroom! 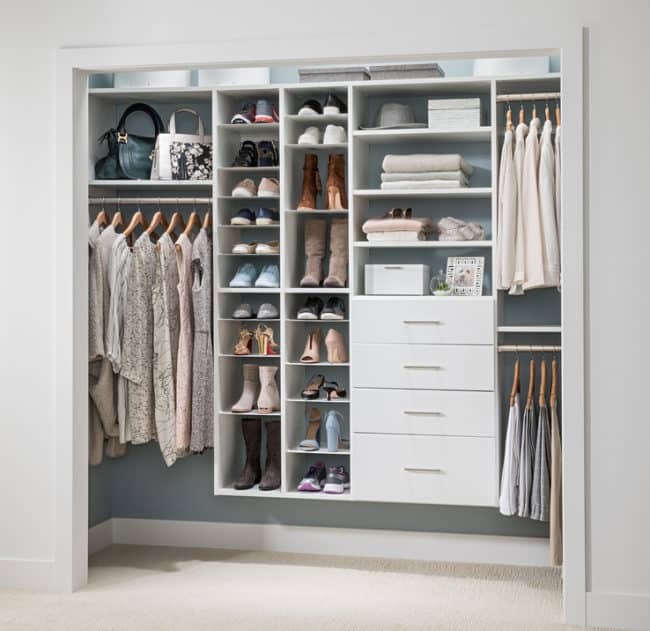 Hand down- the biggest thing you can do to maximize storage in your bedroom is to make sure that you are using every inch of your closet space. And if your closet is just a long hanging bar with a shelf above it- there is no way you are maximizing that square footage! 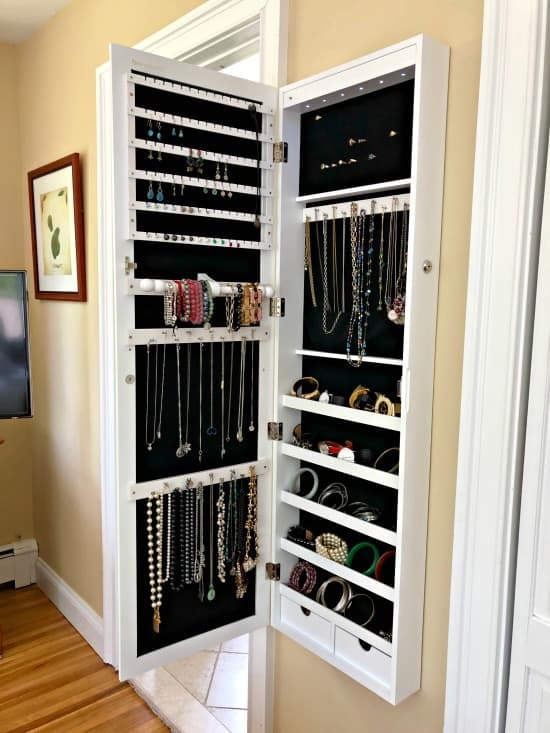 We installed a closet shelving system from Easy Closets This is an affiliate link: MomOf6 earns a commission if you purchase, at no additional cost to you. ourselves. It was literally 1/2 the price of one of those companies that comes out and designs a custom closet for you! You simply measure the space, design it online at EasyClosets.com This is an affiliate link: MomOf6 earns a commission if you purchase, at no additional cost to you. , and they ship everything to you in just a few days. And then in a few hours- you can install it yourself (it truly super easy!). MomOf6 readers can use code CLOSETS165 to get 5% off of your order plus free shipping! Looking for some ideas on how to organize an existing closet? Then check out this post on 12 Organized Closet Ideas! You want to make the most of the space dedicated to the largest object in the bedroom- the bed! Using a headboard with shelves like this one This is an affiliate link: MomOf6 earns a commission if you purchase, at no additional cost to you. gives you a place to store books and magazines (who doesn't love to read in bed?! ), as well as charging cords or an alarm clock. This bed also comes with 6 storage drawers! Have a headboard you love already? Use it with this storage platform This is an affiliate link: MomOf6 earns a commission if you purchase, at no additional cost to you. 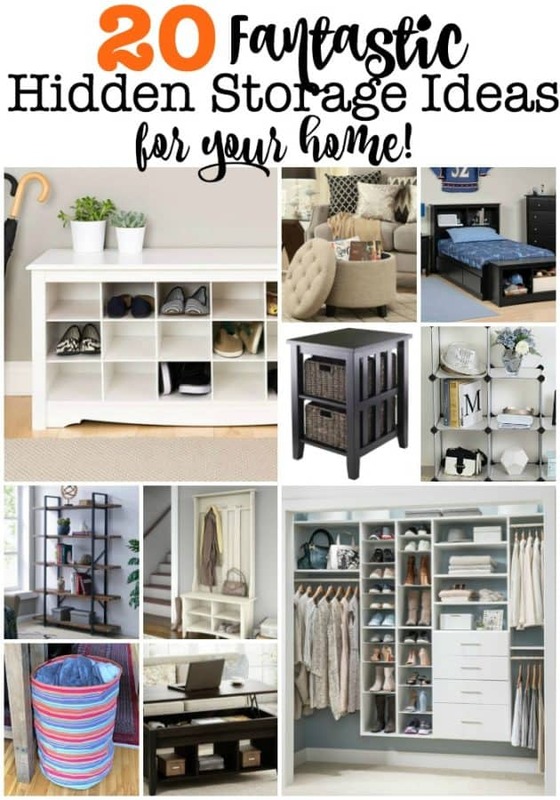 which will give you 6 drawers where you can store off-season clothing, linens, or shoes! These wooden under-bed storage drawers This is an affiliate link: MomOf6 earns a commission if you purchase, at no additional cost to you. have casters, making them easy to slide in and out- and I love the chalkboard label to make it easy to remember what's inside! Don't let the space at the foot of the bed go unused! 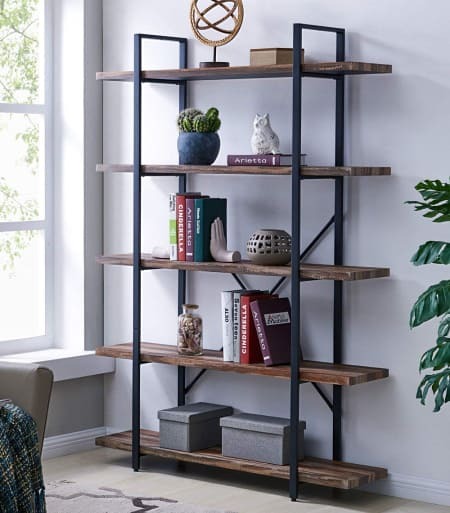 You can install a low two-shelf bookshelf This is an affiliate link: MomOf6 earns a commission if you purchase, at no additional cost to you. for instant storage- but what I really like to do- is to place a long ottoman-style storage bench This is an affiliate link: MomOf6 earns a commission if you purchase, at no additional cost to you. like the one above at the base of my bed. It gives me a place to sit while putting on my shoes- and the storage inside is hidden- so I don't have to dust it (as I would a bookshelf) nor keep it nice and neat! In bedrooms where my kids have bunk beds (which is another way to maximize space in a small bedroom- especially when two kids share the room!) 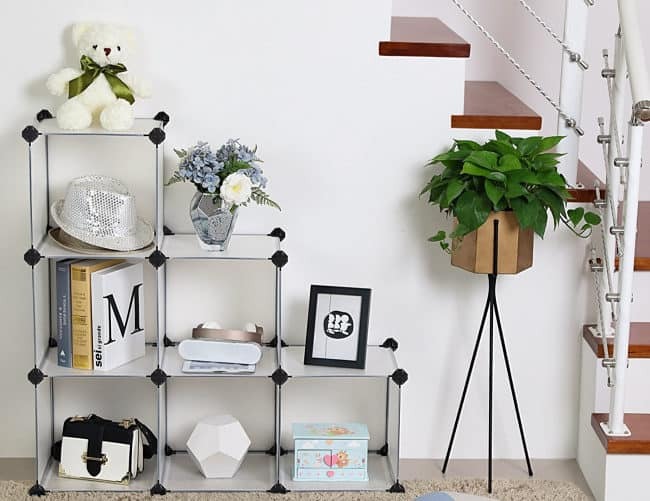 we use these cube organizers This is an affiliate link: MomOf6 earns a commission if you purchase, at no additional cost to you. at the foot of the bunk beds along with storage bins This is an affiliate link: MomOf6 earns a commission if you purchase, at no additional cost to you. to create lots of places for kids to store their “treasures”! Of course you want to use nightstands that offer storage as well- a great place to hold lamps, a charging station, maybe some reading materials. I like this one This is an affiliate link: MomOf6 earns a commission if you purchase, at no additional cost to you. because it offers both a drawer as well as a cabinet- so storage is hidden. 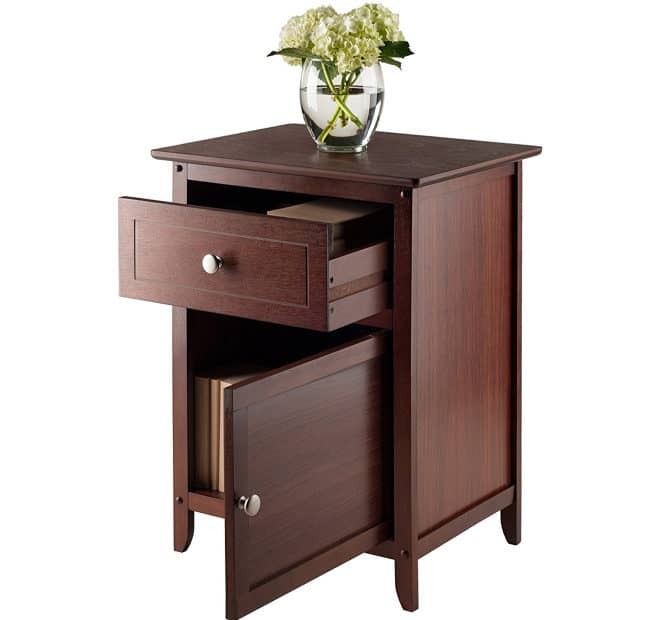 But if you don't have room for a nightstand- this felt bedside caddy This is an affiliate link: MomOf6 earns a commission if you purchase, at no additional cost to you. 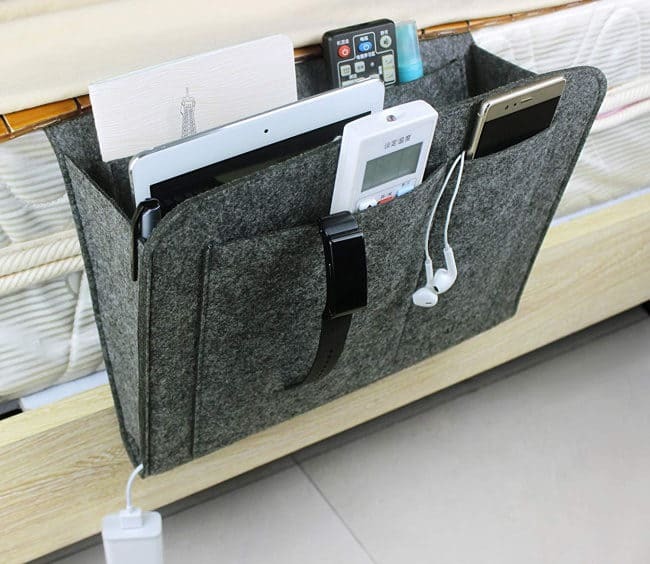 will give you a place to charge your phone and hold a book or a magazine, and it hangs right from your bed! When your family or guests walk in the front door- you want there to be a place where they can hang up coats, take off shoes, and put their things down. And if you rely on your (probably over-stuffed) coat closet- you might just end up dumping everything on the floor! Which is why I love hooks, benches, and locker-style units This is an affiliate link: MomOf6 earns a commission if you purchase, at no additional cost to you. installed near the front door or in the mudroom! It just makes it easy for everyone to hang things up neatly- and find them later when they need them! And what is needed the most at the front door is a place for everyone to put their shoes! Otherwise I spend the rest of the evening tripping all over them on my way up the stairs! 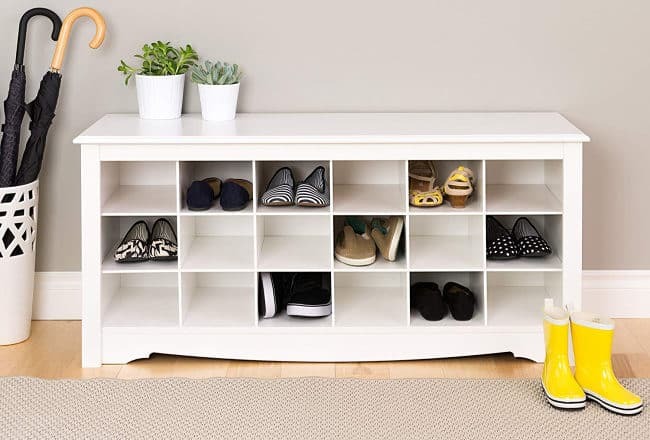 I love this bench with storage for 18 pairs of shoes This is an affiliate link: MomOf6 earns a commission if you purchase, at no additional cost to you. ! Looking for some ideas on how to organize your mudroom and entryway? 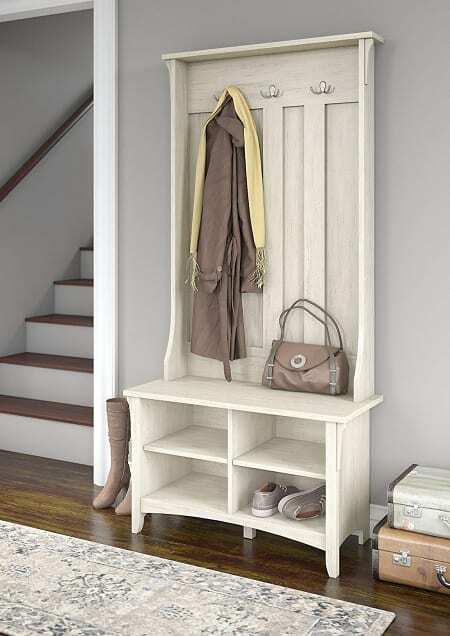 Then check out this post on 12 Ideas for Entryway and Mudroom Organization! Living spaces in the home can easily become cluttered with toys, books, gadgets, and all of the stuff we use in our daily lives! Hidden storage areas in our living rooms can help to keep things neat and organized- and make it easier to find them when you need them! This pop-up coffee table This is an affiliate link: MomOf6 earns a commission if you purchase, at no additional cost to you. is great for so many reasons! It has cubbies in the lower section where you can place items, a pop-up top so you can store the TV remotes and other items (like snacks you want to hide from your kids!) 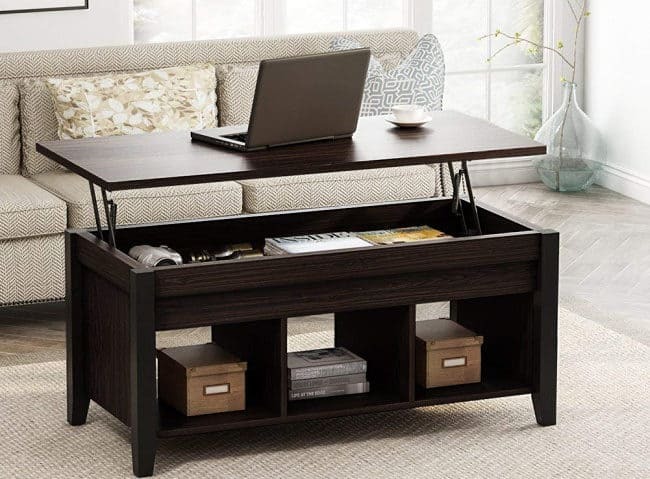 inside, and it lifts to desk height- perfect for working or enjoying dinner while binge-watching Netflix! 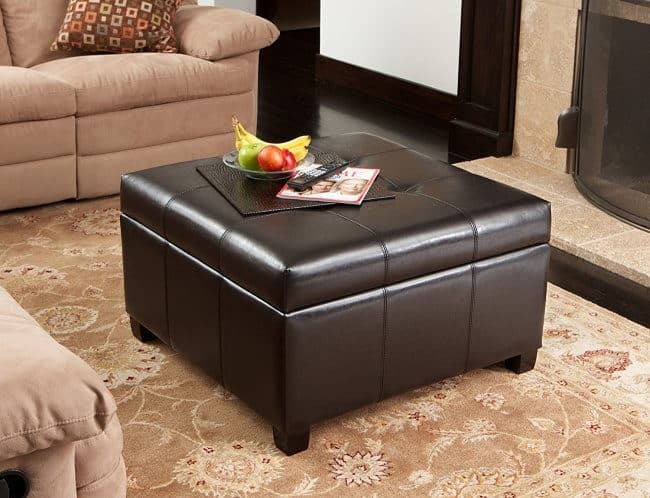 This storage ottoman This is an affiliate link: MomOf6 earns a commission if you purchase, at no additional cost to you. is similar to the one I have in my family room. I love the hidden storage underneath the top- and because this is a comfy leather table- you can use it both as a cocktail table, or even as seating when you have lots of guests! 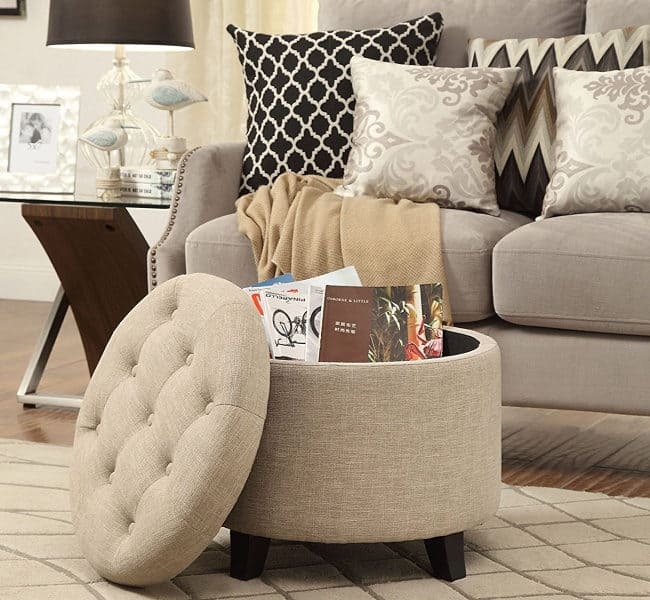 Or I love the idea of having several of these smaller round storage ottomans This is an affiliate link: MomOf6 earns a commission if you purchase, at no additional cost to you. in the room- where they can serve as footstools, end tables, as well as seating-all while providing hidden storage too! Living spaces need sturdy end tables as well- for holding lamps, beverages, and things that aren't going to balance well on a soft-topped ottoman! 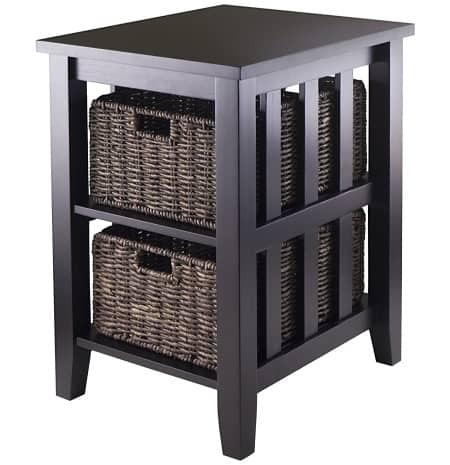 I love these wood side tables This is an affiliate link: MomOf6 earns a commission if you purchase, at no additional cost to you. that come with 2 baskets. This would be a great place to store decks of cards, kids games (stored in ziptop bags instead of their boxes), and more! A bookshelf is the best way to make use of the wall space you have available! I love this one with the tiers of wood shelving This is an affiliate link: MomOf6 earns a commission if you purchase, at no additional cost to you. – and especially the use of fabic boxes with lids This is an affiliate link: MomOf6 earns a commission if you purchase, at no additional cost to you. on the bottom shelf! 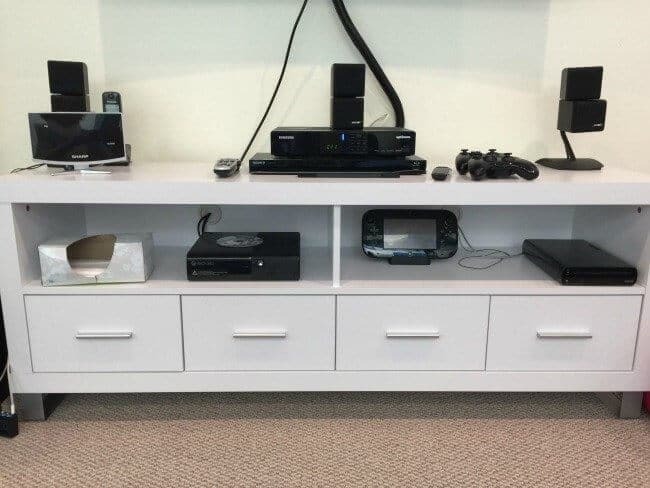 A media cabinet in a living space gives you a place to store all of those cable boxes, game consoles, controllers, DVD players, and everything that accompanies your TV. We installed this media cabinet This is an affiliate link: MomOf6 earns a commission if you purchase, at no additional cost to you. in our finished basement. The drawers hold video games, DVDs, and additional cords. It helps to keep the mess hidden! 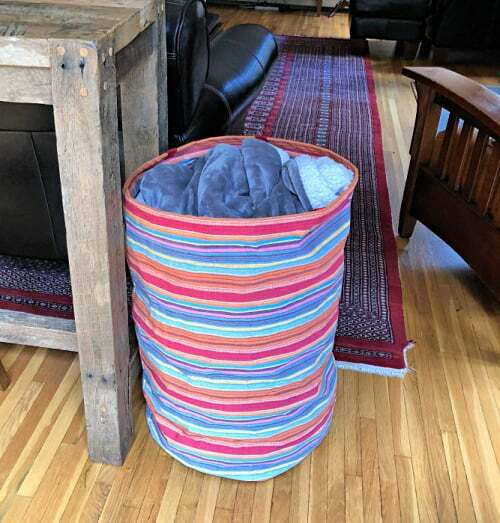 I like to use a canvas pop-up bin like this one This is an affiliate link: MomOf6 earns a commission if you purchase, at no additional cost to you. in our living room to store throw blankets. This keeps the whole room looking neat and when I want to wash them- I just carry the tote into the laundry room! 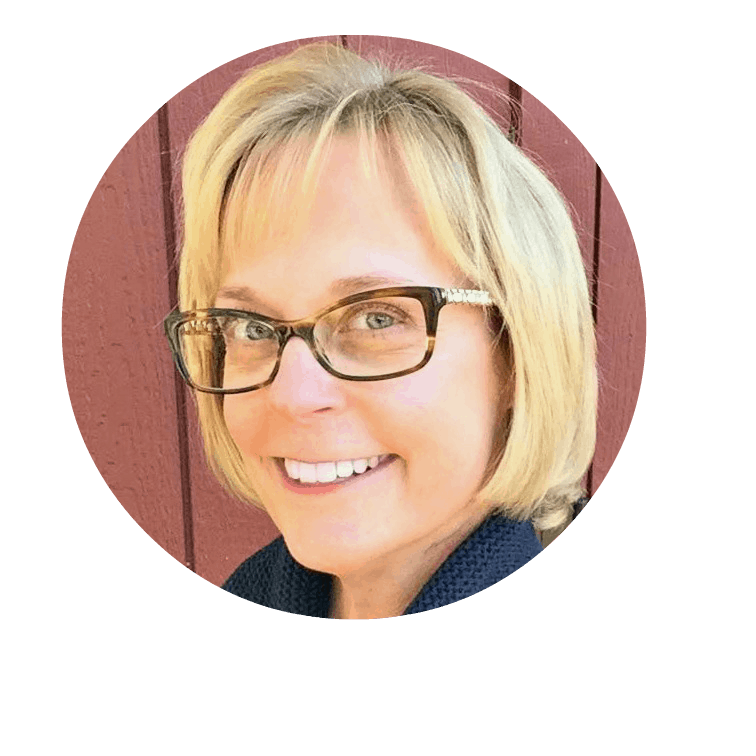 Check out more of our Best Picks for Busy Moms! The Best Family Calendars for 2018-2019! The Best Planners for Busy Moms (for 2018-2019)!